Alpha Chi Omega's Founders chose "Alpha," the first letter of the Greek alphabet, because they were forming the first fraternity in the school of music. Since they thought they might also be founding the last such fraternity, "Omega" seemed appropriate. "Kai," meaning "and," was added to form the beginning and the end. "Kai" was soon changed to "Chi," a letter of the Greek alphabet=Alpha Chi Omega. 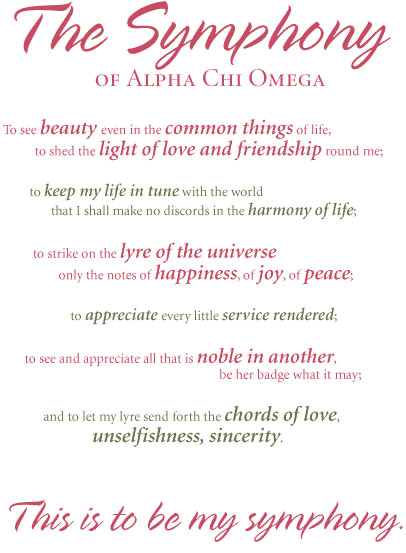 ​The Lyre of Alpha Chi Omega was chosen by our founders after much research. The one they decided upon was the replica of the harp because it stayed true to their musical interest. The founders were also delighted to find that according to Greek mythology the first instrument played by the gods on Mt. Olympus was a lyre! ​"Together let us seek the heights." Founders' Day - October 15 - Sisters gather on this day each year to recognize and celebrate the fraternity’s fall founding at DePauw University in Greencastle, Indiana. Traditionally, collegians and alumnae honor our Founders with acts of service, friendship and leadership, and by coming together to celebrate Alpha Chi Omega’s heritage. Hera Day - March 1 - In honor of our patron goddess Hera, Alpha Chi Omegas dedicate themselves on this day to aid the happiness and well-being of others. Our remembrances include volunteering and fundraising for domestic violence shelters in local communities. MacDowell Month - February - Named for the MacDowell artists’ colony in New Hampshire (Alpha Chi Omega’s first philanthropic project), this month also honors our Founders’ heritage as musicians. During MacDowell Month, our members are encouraged to become patrons of the arts, and attend exhibitions, concerts and other events. National Convention - Members join together every two years to conduct Fraternity business, reunite with fellow Alpha Chis and celebrate Alpha Chi Omega.